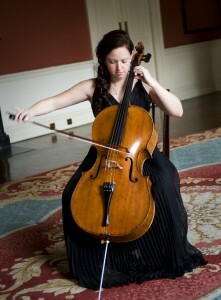 Gráinne Hope achieved her BA Music Degree at DIT Conservatory of Music and Drama before travelling to study cello with Ann Martindale Williams at Duquesne University, Pittsburgh in the USA. In high demand by professional ensembles in Ireland, Gráinne regularly performs with the RTE National Symphony Orchestra, RTE Concert Orchestra, Wexford Opera Festival Orchestra and the Ulster Orchestra. Gráinne has performed with Camerata Ireland on International Tours to America, Finland, China and Russia, and is founding member of the chamber ensemble Musici Ireland. She has performed on radio and television with renowned classical performers as Jose Carreras, Sarah Chang, Katherine Jenkins and numerous popular artists including The Three Priests, Colm Wilkinson, Bill Bailey, Ronan Tynan, Sharon Shannon and Liam O Flynn. Gráinne is creator and artistic director of ‘Kids’ Classics’ which brings together some of Ireland’s leading professional musicians in an educational, fun and interactive experience for children. Kids’ Classics delivers a series of monthly workshops that takes place in Children’s University Hospital Temple St, Our Lady’s Children’s Hospital Crumlin, The National Children’s Hospital Tallaght, Beaumont Hospital Children’s Ward and Laura Lynn Hospice. Kids’ Classics also designed and delivered Ireland’s first music residency in a Paediatric Hospital in 2012 which took place in Our Lady’s Children’s Hospital, Crumlin. Gráinne qualified as a trainer of Musicians in Healthcare as one of a team of three Irish musicians chosen to be part of a pioneering European programme with Music Network, Ireland, Musique et Santé, France, Turku University, Finland and the Royal Northern College of Music, UK in Training Trainers for Music in Healthcare Settings. As an education facilitator she works with the Education Community and Outreach programme of the National Concert Hall and has been involved with their “Parent and Toddler” workshops and “Up Tempo” project. She has facilitated workshops for The Ark (Children’s Cultural Centre) in Dublin, tutors the YOPs Youth Orchestras and teaches strings to primary school students on Dublin City South East Strings Project taking place in Deis Schools.